Harvest and enjoy the garden-fresh flavor of tomatoes right outside your kitchen. Grow them in containers set on your patio, balcony, deck or stairs. You’ll enjoy the convenience of harvesting fresh tomatoes just a few feet away from where you prepare your meals. And your guests will enjoy harvesting fresh tomatoes to add to their salad or sandwich. Tomatoes need warm air and soil to thrive. Containers give you the ability to jump start the season. Plant tomatoes in containers earlier than in the garden and leave them outdoors when it’s warm (but bring them inside whenever there’s a danger of frost.) Protect your plants with the help of season-extending products like cloches, red tomato teepees or garden fabrics. These will help warm the soil and air around the plants, reducing the number of days to your first harvest. Select flavorful and disease-resistant varieties for your container gardens. Consider ‘determinate’ tomatoes that are more compact and generally less than four feet tall. But don’t eliminate your favorite indeterminate tomato. Just provide a strong tall support for these plants that continue to grow six feet and taller throughout the season. Grow your tomatoes in a sunny spot that receives at least eight hours of direct sunlight. You’ll grow the biggest harvest and reduce the risk of disease. Fill your container with a quality well-drained potting mix. Add a slow release organic fertilizer to your potting mix if needed. This type of fertilizer feeds the plants for several months. Give the plants an additional feeding midseason or as directed on the fertilizer package. Check soil moisture daily, water thoroughly and often enough to keep the soil slightly moist. Maintaining consistent soil moisture means healthier plants and fewer problems with blossom end rot. This disorder is not a deadly disease, but it causes the bottom of the first set of fruit to turn black. 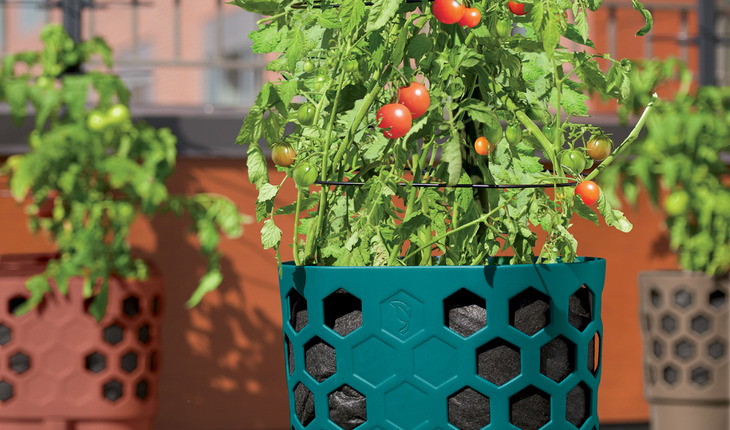 Reduce your workload by using self-watering pots like the Gardener’s Revolution® Classic Tomato Planter (gardeners.com). These pots have a 5-gallon reservoir for holding water that moves up into the soil to the plant roots as needed. This means you’ll be filling the reservoir less often than you would normally water other planters. Stake or tower your plants to save space, increase air circulation around and light penetration into the plant. You’ll further reduce the risk of disease and increase productivity by growing vertically. So start gathering your favorite tomato recipes now, as soon you’ll be harvesting armloads of tomatoes to use in salsas, salads, sauces and of course BLTs.